ENDOCEM Zr is a next generation MTA with minimal discoloration and calcification. Its physical properties include enhanced esthetics with a tooth color formula; excellent sealing property and biocompatibility; less discoloration; and decreased calcification, optimized for partial pulpotomy of anterior teeth. Some issues may arise when using MTA for endodontic microsurgery and vital pulp therapy over time. The first issue is that of compromised esthetics. There are numerous products that are alleged to be tooth colored formula MTAs which designed for use on anterior teeth. Many of these products do not meet expectations esthetically, as discoloration is seen on treated or adjacent teeth after clinical application. Another issue is that of calcification. When vital pulp therapy is performed on anterior teeth using MTA, partial pulpotomy is often performed to ensure adequate thicknesses of MTA and the final restoration. 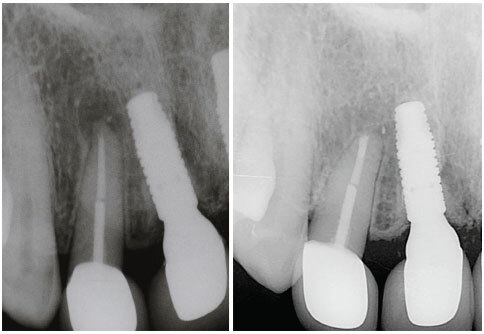 When doing so, calcification of the root canal or pulp chamber ensues, problematic for future treatment. ENDOCEM Zr is the most esthetic MTA with minimal tooth discoloration. It is the safest MTA that exhibits low grade discalcification of pulp chambers and root canals even long after partial pulpotomy therapy. Great handling properties in partial pulpotomy therapy of anterior teeth such as fast setting time, flowability, and radiopacity allow for meticulous sealing of long, narrow canals of anterior teeth. 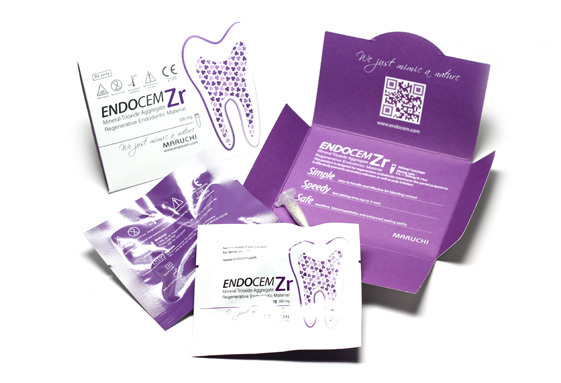 With ENDOCEM Zr, tooth discoloration and calcification of pulp chamber and root canal have been minimized. Apical view of tooth extracted 1 year after intentional transplantation (retro-filling with ENDOCEM Zr) was performed for regeneration of alveolar bony tissue. No tooth discoloration is found. 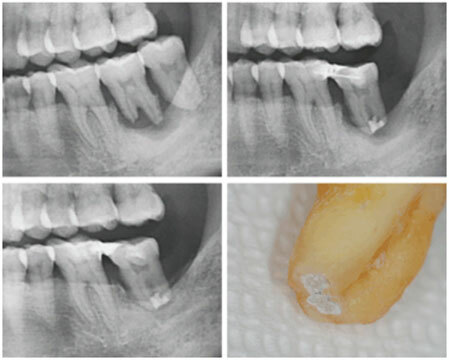 Crown of a wisdom tooth which engages IAC was removed and partial pulpotomy was performed using ENDOCEM Zr, extracted 8 months after treatment. No discoloration whatsoever is found at the sectioned surface of the extracted wisdom tooth. However, it should be noted that if bacterial growth ensues, ENDOCEM Zr surface may become discolored because ENDOCEM Zr is multi-porous in structure and has no cytotoxicity. Also, long term exposure to saliva or tissue fluid could cause degradation of the surface, and thus cause the surface to darken. To avoid discoloration, treatment should be done with bleeding controlled, and the surface of ENDOCEM Zr should be covered for protection by composite resin after setting. This SEM view shows thin layer of secondary dentin on the ENDOCEM Zr contact area, with healthy pulp tissue free from infiltration of inflammatory cells or calcification of pulp chamber or root canal. Application of direct occlusal force should be avoided because ENDOCEM Zr exhibits less tensile strength than conventional MTA. ENDOCEM Zr should be used as a liner, not as a base, in vital pulp therapy. Composite resin with a sufficient thickness is absolutely necessary to avoid contamination with saliva, discoloration and compromise of sealing. Although lack of bleeding control does not affect treatment outcomes, it may cause discoloration. Bleeding may be controlled by filling 5.25% NaOcl in the cavity. ENDOCEM Zr should be applied immediately after bleeding is controlled and excess NaOcl is absorbed. Blood clots formed through this process are key to successful tissue regeneration. After ENDOCEM Zr application, sealing should be maximized according to clinician preference, such as condensing with the handle of a paper point. In partial pulpotomy, if excessive force is used to place ENDOCEM Zr in the pulp chamber or root canal, severe discomfort including percussion reaction could occur, lasting approximately 1 month. Unlike direct pulp capping, blood supply does play an important role in partial pulpotomy, and if it is judged that the blood supply is insufficient, the treatment should be completed by performing direct pulp capping. Once unsealed, ENDOCEM Zr must be used and discarded, as it may become denatured and result in failure. Partial pulpotomy performed using ENDOCEM Zr and resin filling restoration on a fractured anterior tooth. Unlike conventional MTA cases, there is no dark color observed underneath the restoration. Due to a pin-point pulp exposure after preparation, partial pulpotomy was performed to ensure thickness of ENDOCEM Zr and resin filling. After confirmation of setting of ENDOCEM Zr, resin filling was completed for protection after removing a slight amount of ENDOCEM Zr in cavity opening.